This thesis studies multi-phase materials. One such material, dual-phase steel, is nowadays widely applied in car bodies, as it is strong and ductile (as opposed to conventional steels which are strong or ductile). By using such advanced materials, cars can be designed to be lightweight, and thus fuel efficient, but nevertheless also safe in crash situations. Zooming in on the material, the microstructure comprises grains of two phases (`materials’): one hard but relatively brittle and one soft and ductile. Understanding the resulting mechanical properties of such microstructures, in particular in the damage and fracture regime, entails significant scientific challenges. In fact, many paradoxical observations have been reported in the literature. The objective of this thesis is to unravel the relationship between fracture and the distribution of the phases. 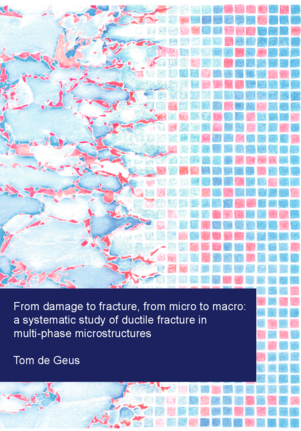 A statistical approach is developed, whereby the typical phase distribution around fracture is characterized by averaging a large number of microstructural simulations or experimental observations. This ‘big data’ approach has enhanced the understanding of the fracture mechanisms in multi-phase materials. The developed approach is relevant beyond the micromechanics of fracture, and may assist systematic and objective analyses of other micromechanical phenomena. Multi-phase materials are of great importance for engineering applications, because of their favorable combination of strength and ductility. This unique combination of properties enables lightweight yet safe design for instance in the automotive industry. The in-depth understanding of the mechanical properties of these materials is thus necessary in enabling future environmentally friendly designs. The multi-phase materials studied throughout this thesis obtain their strength and ductility by combining two or more phases with distinct mechanical and failure properties. The phases are thereby dispersed throughout the microstructure, often resulting in a complex morphology. This entails significant scientific challenges for the understanding and characterization of the resulting mechanical properties, in particular in the damage and fracture regime. In fact, although single phase materials are well understood, many apparent contradictory observations have been reported for multi-phase materials. This can be overcome using a systematic micromechanical study. However, this is a non-trivial objective, neither experimentally nor computationally, since many microstructures have to be transparently compared to unravel the worst-case scenario. To facilitate a statistical study that includes many realizations of the microstructure, this thesis includes only the basic mechanical and morphological features. This way, the influence of the spatial arrangement of phases on fracture initiation is transparently qualified and quantified. It furthermore enables the systematic identification of the role of the relative amount of phases, of the contrast in their mechanical properties, and of the macroscopic stress state. Exploiting these first results, more complicated microstructures are studied: through simulations in two and three dimensions, and directly through experiments. The basic model is established by assuming a microstructure that consists of two phases; a soft and ductile matrix reinforced with a hard and brittle phase. The morphology is idealized, whereby the microstructure is constructed from equi-sized cells which are randomly assigned the properties of the soft or the hard phase. Damage is modeled using simple indicators which predict failure of individual cells (or ‘grains’). These simplifications with respect to reality enable a systematic study in which: (1) the computations are fast, allowing a statistical comparison of many different microstructures and parameters, (2) variations in terms of volume fraction are well controlled, and (3) the identification of the average distribution of phases around fracture initiation sites is well defined and transparent. The extension to three dimensions is feasible, in particular when the simple model is paired with an efficient spectral solver. To enable the treatment of arbitrary non-linear problems, this thesis includes improvements tot the spectral solver that result in robust convergence. The results show that damage initiation occurs where regions of the hard phase, aligned with tension, are interrupted by bands of the soft phase in the directions of shear. At this intersection, The hard phase triggers high hydrostatic tensile stresses, while giving sufficient room for the shear bands in the soft phase resulting in a high plastic strain. The results of the two- and three-dimensional microstructures are qualitatively consistent. A difference is that the local strain partitioning between the two phases is over-predicted by a two-dimensional microstructure, leading to an overestimation of damage. A similar statistical analysis has been performed directly on experimentally obtained micrographs, revealing a similar mechanism. Observed differences are due to the different statistical properties of the real material and the simple microstructures used in the simulations. This is shown through simulations based directly on micrographs. The two-dimensional model is used to consider large range parameter variations. Depending on the stress triaxiality it is observed that generally one of the phases dominates macroscopic fracture initiation: at low stress triaxiality the soft phase dominates, whereas the hard phase dominates above a critical triaxiality. In the latter regime, a strong decrease in ductility results. The transition between the two regimes is strongly dependent on microstructural parameters. If the hard phase volume fraction is small, the fracture initiation is dominated by the soft phase even at high phase contrast. At higher hard phase volume fraction, the hard phase dominates already for a low phase contrast. This simple model thereby reconciles experimental observations from the literature. Beyond the stage of void nucleation, early nucleated voids start influencing the sequel of damage mechanisms. It is found that, at a certain strain level, voids start to link up along a percolating path of soft phase aligned with the directions of shear. The relative spatial positions of the early voids thereby determine whether the onset of final fracture occurs early or at a substantially large strain. Hence, the macroscopically observed failure is largely predetermined by the microstructure. The nucleation of voids is determined by the local arrangement of the phases, while damage propagation is controlled on a longer length-scale relying on a critical relative position of `initiation hot-spots’. Although more research is needed to validate the conclusions of this thesis for more realistic microstructures and different load cases, this thesis has contributed to the state of the art for multi-phase metals by performing a systematic analysis. Additionally, the proposed statistical perspective may assist systematic and objective analyses of other micromechanical phenomena in the future.